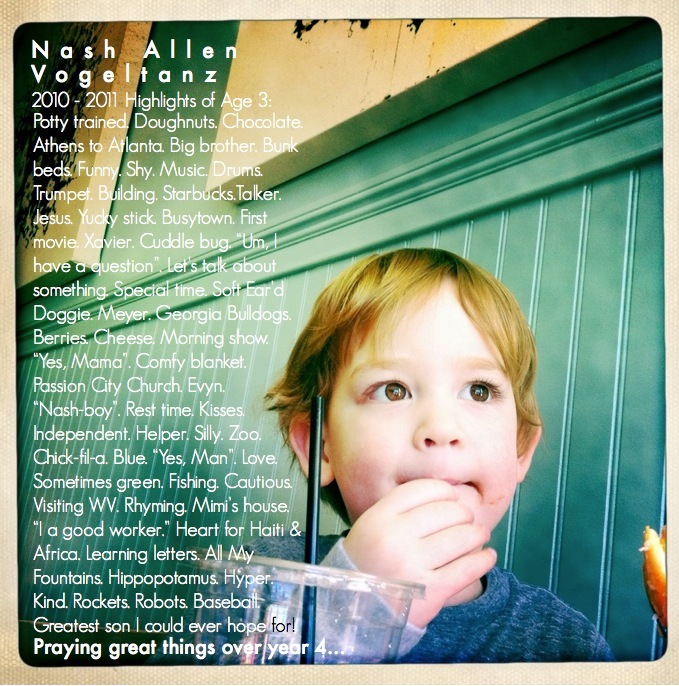 Nash, welcome to age 4! Four years ago today, Bryson and I began our greatest and most ambitious adventure: PARENTING. Little did we know it would be the most amazing, challenging, exciting, exhausting, rewarding, incredible, and humbling experience of our lives.Nash Allen Vogeltanz, you made us parents and better people! Oh how we love and adore you. Happy birthday to our precious firstborn! Happy birthday, Nash! Can’t believe you’re four! All the kids are getting so big. so cute! he is going to love having that to read when he is older!